Under the View menu select the Summary Page & Data Entry tab. Double click the Add New as seen below. Select the name from the drop down list. If a name record has not been created select the Add New Name button to prompt a new “Name Information” window to create the name record. Enter the date, amount and description of the contribution received. If the contribution was associated with a fund raising event held by your committee click the Fund Raising Event drop down to select the appropriate event. 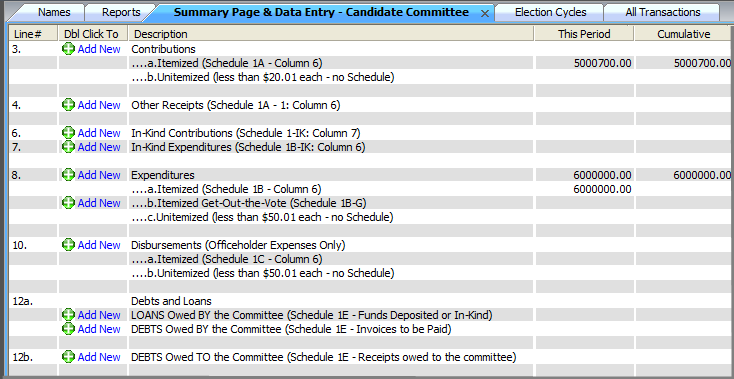 Select view PACs only to only display Independent and Political (PAC) committees in the name drop down list. Select Add New Name to add a new name record. Select Next to save entry and add new entries. Select Clone to save entry and retain the date, amount, description and fund raising event (if applicable) for the next entry. Select Ok to save the entry and close out of the transaction information window. 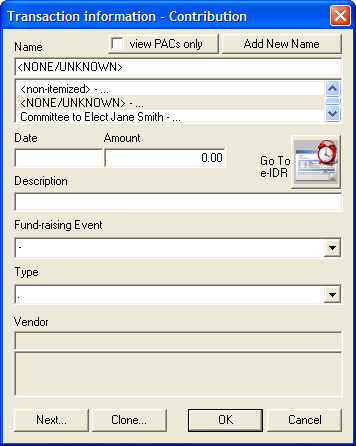 Select Cancel to close out of the transaction information window. For more information on filing Late Contribution Reports or other Immediate Disclosure Reports. To Modify an existing transaction open the All Transaction tab and locate the desired record. Right click and choose modify to make the necessary changes. To Delete an existing transaction open the All Transaction tab and locate the desired record. Right click and choose delete. Please note the transactions within a closed campaign statement cannot be deleted. To remove a transaction from a previously filed report, select ‘De-Report’ to remove the the transaction from the amended campaign statement. The original transaction will continue to show in the ‘All Transactions’ tab as a shaded item.